U.S. officials are finalizing a new effort to crackdown on Iran's top terror organization as part of an effort to reverse sweeping sanctions originally granted by the Obama administration as part of a little known deal to enrich entities tied to the powerful Revolutionary Guard Corps, or IRGC, according to sources familiar with the effort. In late fall of 2016, the Obama administration loosened prohibitions on doing business with companies tied to the IRGC—which is responsible for the deaths of hundreds of Americans—by publishing new language on what constituted IRGC "control" of these entities. This back-door concession to Iran sparked outrage from lawmakers and pro-Israel groups and later fueled a Trump administration push to declare the IRGC a terror organization. A new congressional bid will now seek to revise that standard for IRGC "control," reversing a portion of Obama-era sanctions relief that has helped Iran fund its massive military intervention in Syria and other regional hotspots. The push is already said to be gaining support from the American Israel Public Affairs Committee, or AIPAC, the United States's leading pro-Israel lobbying group, which will support the new effort during its annual policy conference in Washington, D.C., next month. Tens of thousands of supporters who turn out for AIPAC's conference will help lobby in favor of the legislation, as well as other related efforts to constrain Iran's growing influence in the region. The group also will throw its support behind an effort to provide Israel with new munitions in light of its efforts to counter Iran. One source with knowledge of the situation told the Washington Free Beacon that efforts to patch this Obama-era concession have been in the works for some time and are now becoming public. "This has been a longtime coming. The Obama administration used every last trick to loosen sanctions on Iran, even hiding concessions in online FAQs and then claiming nothing had changed when they got caught, which is what happened in fall of 2016," said the source, a veteran congressional adviser briefed on AIPAC's push. "AIPAC and Congress both called out the back-door sanctions relief at the time and said they'd pursue legislative fixes," the source said. "A few months later the Trump transition team started taking over and pursuing fixes, and now it's back over to Congress to put everything into law. AIPAC knows where the bodies on this one are buried, and will be providing invaluable policy and political advice." AIPAC did not confirm to the Free Beacon by press time that the push to revise standards for "control" by the IRGC will be on the agenda. The administration and Congress are seeking to send a clear message to the world that Iran is not open for business, despite efforts by the Obama administration to promote renewed trade, one senior Trump administration familiar with new efforts to crackdown on Iran told the Free Beacon. "What we saw in Iran in late December and early January was the extreme dissatisfaction of the Iranian people with an economy that's being run to service the military, not to help the Iranian people," the official said. "What tightening this will do is make it clear the U.S. stands with the people with Iran, not the IRGC." European allies should proceed with caution when entering the Iranian economy, the official said. "Our friends and allies who are doing business with this regime should think about who they want to interact with: Do they want to interact with the IRGC—which is spreading violent mayhem throughout the Middle East—or do they want an Iran that's postured to create economic growth, thriving business, and authentic, transparent partners we can work with?" the official asked. Earlier this month, White House National Security Adviser H.R. McMaster delivered a speech in Munich warning companies that doing business with Iran would enrich the IRGC and risked running afoul of Washington. Top Iranian officials responded by accusing McMaster and the United States of violating the nuclear deal. 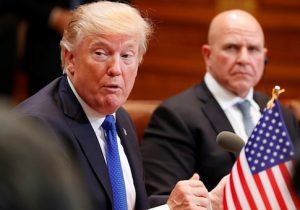 "Don't do business with the IRGC; don't enrich the IRGC; don't enable their murderous campaign; don't enable their threat to our friends in the region and to—especially Israel but also Saudi Arabia and others," McMaster said. "It's in everyone's interest to really work hard on business intelligence to understand who are the beneficial owners of these companies who were, you know, opening up checkbooks and doing business with in Iran." CIA Director Mike Pompeo has made similar remarks in recent weeks, warning the international community that doing business with Iran could make it a party to the IRGC's continued terror operations. The Trump administration has been targeting the Obama-era concession to Iran since even before taking office. Sources close to the transition told journalists at the time they would be revising the Treasury guidelines—specifically the standard for "control" that had been used to provide additional sanctions.